What is Dermal Lip Filler treatment? At Sheer Laser Clinic, we use Juvederm® lip fillers to subtly reshape and redefine your lips for a rejuvenated, fresher look. Juvederm®’s fillers have been specially developed as a smooth gel that gives your lips a soft, natural feel. The gel fills in the fine lines and wrinkles in your lips, making them appear fuller and better defined, while the hyaluronic acid attracts and retains moisture. As the lips can be sensitive, a local anaesthetic is first applied to the lips to ensure the area is numb. Lip fillers are then very carefully injected into the area required to give you more natural fuller lips. The filler used is specifically designed to restore natural fullness and create beautifully shaped lips. Lip borders can be defined and the shape and size of the lips can be enhanced either subtly or dramatically depending on the result the client desires. This treatment is also ideal for removing lines and creases around the mouth area (including ‘smoker’s lines’). Dermal Fillers are also used as Facial Fillers to help restore lost volume and definition within the skin. What can Dermal Lip Fillers be used to treat? With Lip Fillers, we can make your lips look plumper, smooth away vertical ‘smokers’ lines’ around your lips, better define the Cupid’s bow, add symmetry, and subtly lift the corners of your mouth to rejuvenate your smile. How do Dermal Lip Fillers actually work? Dermal Filler is injected into the lips to define the lip borders and/or create a fuller, plumped-out effect. We can inject as much or as little filler as the patient requires to give a subtle or more dramatic result. Are Dermal Lip Fillers safe? When performed by appropriately trained medical practitioners, Dermal Lip Fillers are very safe. The hyaluronic gel is completely natural, and over time, the filler will slowly dissolve, causing no harm to you. Juvederm® lip fillers have an excellent reputation and safety record; they are FDA-approved and created by Allergan. At Sheer Laser Clinic, you will only ever be treated by one of our highly trained Doctors or Cosmetic Nurses. We believe it is only safe to be administered by someone who is medically trained. 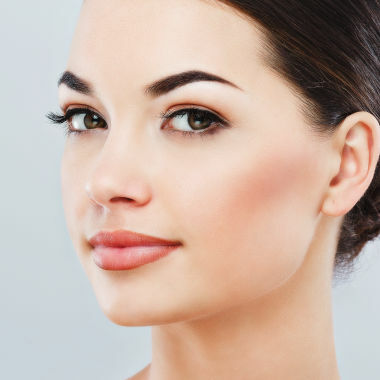 What can I expect during my Dermal Lip Filler treatment? At Sheer Laser Clinic, every client’s needs are unique, therefore each client receives a bespoke consultation with the Doctor or Nurse. During the consultation you will be required to discuss your medical history as well as your problem areas. The practitioner will then discuss the desired improvements, treatment options available to you and the expected outcomes. When a suitable treatment has been agreed upon, the fillers can then be administered. Your practitioner will inject small quantities of filler into the border of the lips or body of the lip depending on the desired effect. The process can be uncomfortable as the lips are sensitive, and therefore topical local anaesthetic will be applied to reduce any pain experienced. The treatment should take approximately 30 minutes and the effects are instant. Does Dermal Lip Filler treatment hurt? You may feel an initial sting but only for a moment. Dermal Fillers are injected using extremely fine needles and your Doctor/Nurse may numb the area using a topical anaesthetic cream prior to commencement of treatment to minimise discomfort. You may notice some soreness in the injection site directly after the treatment, but this should subside quickly. You should be able to see the results of your treatment immediately, although you may need to wait for slight redness or swelling to subside to fully appreciate the results. What do I need to do after my Dermal Lip Filler treatment? You will be given clear aftercare instructions when you undergo Dermal Lip Filler treatment at the Clinic. Take care around the filled area for the period immediately following your treatment. Avoid unnecessary touching/pressure for the first six hours. We may advise you not to wear make-up for up to 12 hours. You should also avoid direct sunlight, saunas and steam rooms for two weeks post-treatment. You may experience a little temporary tenderness, swelling or bruising around the injection sites immediately after your treatments, and it is recommended that you avoid additional procedures in the treated area for the next seven days. Dermal Filler treatments typically last up to six months, after which they breakdown and are absorbed by your body. You may decide to book a another treatment before the fillers wear off. How long will it take to recover from a Dermal Lip Fillers treatment? Recovery time can be from a few hours to a few days depending on your reaction to the treatment. However, most people find that they can return straight back to work after treatment. What are the possible side effects of Dermal Lip Fillers? The most common side effects are mild to moderate and include slight redness, swelling or bruising at the injection site, but these effects usually resolve themselves within a week. Twelve hours after your treatment, you can cover up any discolouration with make-up. Other risks are less likely in the right hands but we will talk you through all of the potential side effects at your initial consultation, so you feel fully informed. Are Dermal Lip Fillers right for me? Naturally you will have questions and some concerns about the treatment which is why we would start your journey by inviting you in for a one-to-one free consultation with our Doctor or Cosmetic Nurse, so that they can provide you with advice as to the most suitable form of treatment for you. We may recommend another treatment if there’s one that we believe would give you a better outcome; we may even advise you against treatment if we feel this to be in your best interest. At all times, we ensure that you receive an an honest assessment that puts your needs first. Who should not have Dermal Lip Filler treatment? As with any treatment to the skin, injections should be avoided in areas where the skin is swollen or where infections are present. Lip Fillers are not suitable for anyone with severe allergies. You should not consider dermal fillers of any kind if you are pregnant or breastfeeding.